Louisiana is known as one of America's great culinary capitals, and crawfish are among the most celebrated of Louisiana's cuisine. From December until June -- and especially during the spring when they're most plentiful -- crawfish are a mealtime staple. 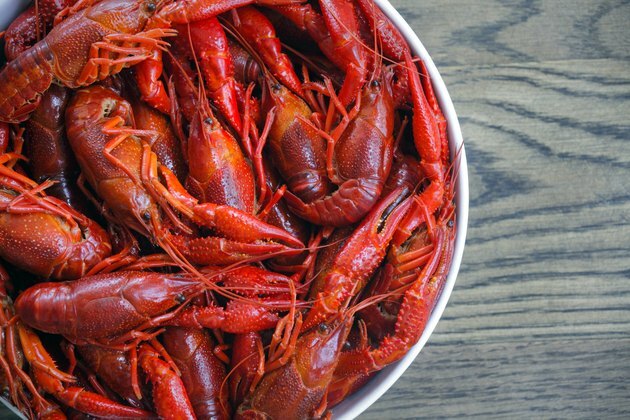 They're used in a variety of ways, but one of the tastiest preparation methods is simply boiling the crawfish in seasoned water. Once they're boiled, leftover crawfish can be frozen for later enjoyment. Crawfish are closely related to shrimp, prawns, langoustines and lobsters. Their anatomy is very similar, varying largely in the size or presence of claws. Crawfish and lobsters are especially similar. Crawfish live in fresh or brackish water, and lobsters live in saltwater; otherwise there's little to tell them apart. American crawfish are relatively small, and it takes roughly 6 or 7 pounds of live crawfish to provide a pound of peeled tail meat. Buying a large quantity of crawfish specifically to cook and freeze is not uncommon, but it's often an excuse for a social occasion as well. A traditional crawfish boil requires a very large pot for boiling, a lot of crawfish and a large, convivial crowd to share them with. The water in the pot is usually seasoned with a salty, zesty spice mixture, either homemade or store-bought. The crawfish are added to the pot and boiled along with baby potatoes, corn, sausages and any other food items you choose. Once cooked, the whole mess is drained and spread across the table for your guests' enjoyment. Leftover cooked crawfish are highly perishable and should be refrigerated or frozen as soon as everybody's finished eating. The simplest way to freeze them is whole in the shell. Package the cooked crawfish in heavy-duty freezer bags and squeeze out as much air as possible before freezing them. Even better, use a vacuum sealer to package them. It eliminates more air, thereby better preserving their delicate flavor. Whole crawfish are quicker to lose quality than peeled tail meat and should be consumed within a month or two. Most of the edible meat on a crawfish is found in the tail, which can be cracked open by placing your thumbs on the underside and pressing the edges of the shell apart. Pull out the tails and place them for one minute in a light solution of water and lemon juice to prevent discoloration. Remove the dark "vein," or digestive tract, and the orange-colored "mustard." The mustard is high in fat and turns rancid in as little as two months. Package the tails in airtight heavy-duty freezer bags or vacuum bags and store them for two to six months.